This section contains the rules of all the variations of poker found in online casinos. They are brought to you courtesy of Max Drayman, from Winneronline. Max is considered the world's expert on online (and land based) casinos. His regular column "Ask Max" can be found at www.winneronline.com. 5-Card Stud is one of those games that puzzles people. Whenever you mention it people say something like "you mean 7-Card Stud?" or "how's that different than Draw Poker?" But 5-Card Stud is a game unto itself although you'll seldom see it played these days. There are a few good reasons for that, but let's cover the basics first. Betting Limits, Buy-In, Bankroll, The Ante, and the Deal are all pretty much the same as 7-Stud and I refer you there for these details. Keep in mind that because 5 Stud is seldom played in the casinos these rules often vary. The truth is that 5 Stud is mostly played as a social game these days, so the rules flex according to the player's tastes. A round opens with the dealer giving each player two cards. Traditionally the first is a pocket (hidden) card and the second is open (face up). There are variations on this and we'll see why shortly. Now it's time for the first bets. Low card opening is standard but it's not uncommon for high card to open. The game progresses the same either way. The betting round circles the table and it's on to Third Street. The third card is dealt to each player as an open card. Betting typically follows 7-Card Stud's Third Street play (Low Limit bets). Another open card, typically played per 7 Stud's Fifth and Sixth Street (High Limit bets). The final card, usually also an open card. Betting as per 7 Stud's Seventh Street (High Limit bets). I've also seen games where Fifth Street was dealt as a pocket card. There's a real problem with traditional 5 Card Stud. With only one pocket card there's not much doubt as to what a player is holding. Furthermore, since there are only 5 cards per player and no discards, most hands are going to be pretty low, mostly pairs and high cards. At least in Draw Poker the player gets a chance to improve their hand by drawing new cards. Not so in 5 Stud: you're stuck with what you get and the other players can see most of that. The end result? Players with even basic play experience will read the cards fast and early. They'll either drop or be going for the pot and it's tough to drag anyone but a novice along for the latter streets. Bottom line is it's a slow game for anything but social events and "friendly" play. This is where the variations come in. The more interesting 5 Stud games I've played are those where there are two pocket cards. Sometimes it's first and last card, sometimes the two opening cards with the player on the dealer's left opening the bets. In the end these variations are simply attempts to add a little suspense. The hands are still going to be low. And the extra pocket card just allows for a little more bluffing and the possibility of chubbier pots. The fact that even these variations only appear in social games tells the same story as before: 5 Card Stud has left the building. When it comes to Poker games, Draw Poker is old school, 5-Card Stud is too rare to speak of, but 7-Card Stud is alive and well. Texas Hold'Em gets all the press and makes a better spectator game, but 7 Stud is the game of choice for the hard-nut players. Stud demands strategy and skill and it takes a lot of play to develop the winner's edge. Top caliber players are few and far between but they have one thing in common with the rookies: every player of the game is still learning, even the masters. Let's begin with the basic rules. Stud games are defined by their betting limits. The low stakes online games are usually $2-$4 while the higher games are typically $8-$16 or $10-$20. I've seen land casino Stud at $100-$200 or higher, but these stakes are very rare on the web. The game's betting limits tell the Stud player pretty much everything they need to know about the nature of the game, the expectations of the players, and the size of the bankroll you should have before you sit in. Your minimum Stud Buy-In is typically 10-times the low limit, or $20 for a $2-$4 game. But playing with the minimum is not recommended (see Money Management in the Strategy section). Anything below the $10-$20 level is generally considered a beginner's game. The skill and strategy levels required in the higher games are substantial and such games generally do not provide a friendly environment for the Stud player still learning their way around. Ante in Stud is mandatory and changes depending on the betting limits. The low games usually require a 10% Ante, so a $5-$10 game will have a $0.50 Ante. The high games get up to 25% on the Ante: that's $25 on a $100-$200 game. The percentages may vary somewhat but 10% is the typical minimum. We'll use a $10-$20 game as our working example, so the Ante is $1, 10% of the low limit. The dealer deals clockwise starting on their immediate left. They deal one card at a time around the table until each player has two pocket cards (face down) and a single up (the "door" card). At this point the dealer indicates which player will open the betting, determined by the lowest door card. If there's a tie for low door, suit resolves it: spades over hearts, followed by diamonds, and finally clubs is the lowest. Once the initial cards have been dealt, the game begins. At this point we've got three cards on the table per player and that's called "Third Street". The player holding the lowest door card must "bring it in" by opening with a bet equal to twice the ante ($2 in our example game). If the low door player doesn't make this bet, they're forced to Fold and the opener passes to the player on their left. The next player clockwise from the opener can Call by matching the opener, Raise by betting the low betting limit ($10) or Fold. Throughout third street all Bets and Raises are fixed at the low betting limit ($10). The dealer gives each player another open (up) card. Unlike third street, the opener in the fourth and remaining streets is the high hand as determined by the open cards. They may Check (Pass) or Bet. It they Bet it's at the low limit ($10) and that fixes all raises in this round to the same. If the high hand is an open pair, the opener can Bet at the upper limit ($20) and this fixes all Raises in the round to the same. Again, the card is dealt up and high hand opens. All Bets and Raises are at the upper limit ($20). The last card, called the "river", is another pocket card (face down). All bets and raises are at the high limit ($20). After the Bets and Raises have been resolved, the remaining players enter the Showdown. The opener reveals his pocket cards. If a player wishes to compete with this hand they too reveal their pocket cards, or they can yield and muck out (Fold). At the casino it's the dealer's responsibility to call the winner, as determined by the best 5-card hand under normal Poker rules. 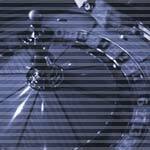 In online games, the software will designate the winner and the pot will be passed to them. It is any player's right to request to see any final hand that has been mucked, though this is primarily intended for casino play. It's true with all the Poker games, but never truer than with 7-Card Stud: the rules are barely the beginning. It's the strategy and gaming skills that make the game. We'll take a stab at those in our 7-Card Stud Strategy section. Caribbean Poker is a favorite game aboard cruise ships and in South Pacific clubs. It's an easy game to learn and employs many of the skills of standard 5-card Stud. You ante in and the dealer deals five cards to you and five to themselves. The dealer turns one of their cards up. At this point you can make an additional bet -- the "call" bet -- or surrender. If you surrender you lose the hand and your ante. If you make the "call" bet then the dealer turns over their cards. To continue to the showdown, the dealer must "qualify" by holding at least an Ace-King or better. If the dealer does not qualify, you win the ante but your "call" bet is simply returned, no matter what the cards show. If the dealer does qualify then it's a good old fashioned showdown, with a catch. If you win, the ante pays even money. But if you win with anything better than a pair, then the house pays you a multiple of your "call" bet based on a bonus ranking. The better your hand, the higher the bonus. There are two betting rounds in a hand of Caribbean Poker. The first is your ante. The second comes when the dealer turns one of their cards face up. If you like what you see and think you're still in the running, you can place a "call" bet -- which is fixed at twice whatever you anted -- and play on. If you don't "call" you surrender and forfeit your ante. Payoff in Caribbean Poker is very simple. If you place a "call" bet and the dealer fails to qualify, you win even money on your ante and the "call" bet is simply returned. If you lose the showdown, the dealer takes both your bets and it's time for another hand. Draw Poker is the basic form of Poker and the place to start when introducing new players to the game. It's fairly uncommon these days in the casinos, but it is the form from which all other Poker games are derived. The essence of Draw Poker is that the player builds a hand from 5 cards. After the initial round of betting the player may discard some or all of their cards and receive replacements. The players cards should never be revealed until the final Showdown, and are only then if absolutely necessary (more on that later). During the game, all cards are dealt and discarded face down. There are two main things to learn when it comes to Draw Poker. The first is Poker's 5-card hands and their ranking. The second is the course of play including when and how to bet. There are no wild cards in Draw Poker. All suits are ranked equally. A round of Poker begins with determining the Dealer. The Deal usually rotates around the table from the right: if you've just dealt then the person on your left deals next. Once assigned, the Dealer receives the deck and shuffles. Each player pays the "ante" which is a small, flat fee you pay to purchase the right to play that round. If you don't ante it means you are "sitting out". These monies and all others in the game go into the center of the table in a pile called "the pot". Once the antes are in, the Dealer deals one card at a time, face down, to each player around the table, beginning on the Dealer's left. Then the second card is dealt to each player, and so on until each player has 5 cards, all face down. Players pick up their cards and assess their hand. The player to the Dealer's left opens the betting round by either placing a Bet, indicating a Pass by placing no bet, or Folding by discarding their hand. The next player to the left now has the opportunity to Bet. Or they can Fold. If the previous players Passed then they can Pass too or place a Bet of their own. If other players have Bet and they wish to stay in the round they must Call by matching any outstanding bets. They can then Raise by placing a bet of their own. The betting then moves to the next player on the left, then the next, and so on back to and including the Dealer. Once the Dealer has placed their bet, the other players must Call any outstanding bets or Fold. Generally speaking, no Raises are permitted once the betting has passed around to the Dealer. Players may now Discard any or all of their cards based on their hopes of building a better hand. Cards are discarded face down and collected by the Dealer. The Dealer now deals each player, starting on the left, their replacement cards, face down. As before the Player on the Dealer's left begins the betting and the betting proceeds around the table. Again, the Dealer gets the final Raise. Then everyone else must Call or Fold. Finally, the remaining players are ready for the Showdown. If at any time there is only one player left in the game they take the pot. This player is encouraged to keep their cards hidden and muck them to the Dealer. After the final betting round, and all the necessary Calls, the players still in the game have reached the Showdown. The player's hands are revealed. The best hand wins and the winner takes the pot. If there are tied winning hands then the rank of the individual cards determines the winner. For instance Full House of Aces over Jacks beats a Full House of Kings over Jacks. If it's still a tie and there are no kickers (spare cards not used to build the final hand) then the pot is split. If the rank of the individual cards doesn't determine the winner, then the kicker(s) of higher rank determines the winner. If it's still a tie, the pot is split. If there are no "name" hands (all players have No Pair), then the highest ranking single card is declared the winning hand. If it comes to a dead tie (no clear winner, all cards same rank) then the pot is split. Suit is never used to determine a winner in Poker. While hands and betting are the basic rules, there is much, much more to being a successful Poker player. Poker is not about having the highest ranking hand, it's about winning the biggest pots. How you do that, short of cheating, is your business and that is what makes Poker the beloved game that it is. Let It Ride is a poker-style casino game. It is a variation of 5-card Stud but differs in that players don't have to beat a dealer's hand or other players. The goal is merely to compile a winning poker hand, with a minimum of a pair of tens. The objective of Let It Ride is to compile the highest 5-card poker hand (containing at least a pair of tens) from three dealt cards and two community cards while keeping the maximum bet on the table. The player opens a round by placing three identical bets on the betting circles. The player is dealt three cards and the dealer places two community cards in the center of the table, face down. Based on the favorability of the three hole cards, the player can withdraw the first bet or "let it ride" and leave it on the table. The dealer then reveals the first community card. Now the player decides whether to withdraw the second bet. The second community card is then revealed and the hand is scored. Note that the third bet stays on the table with no option to withdraw. Also note that withdrawing the second bet is independent of what was done with the first. 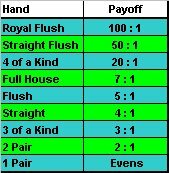 If the player qualifies with at least a pair of tens, the payoff is determined by the quality of the hand. The skill of the player is in knowing when to stay and when to withdraw based on the cards known. While the odds are marginally better for the player than in Caribbean Stud, Let It Ride still carries about a three point edge for the casino even with optimal play. Betting variations include games where players can win a bonus on top of their payout if they opt to place the additional $1 Bonus or Side bet and draw Three-of-a-Kind or better. These are sucker bets and though the specific odds vary from house to house they're all bad and I say forget the bonus. Omaha Hi is a version of Texas Hold'Em where players are dealt four hole cards instead of two. But there's a catch: two and only two of the hole cards can be used in making the final hand. Omaha Hi is also known as Omaha Hold'Em or simply Omaha. The four hole cards make Omaha a nine-card game and having more cards to choose from means players will typically finish with stronger hands. Poker players being the people that they often are, the possibility of higher hands typically means that players stay in longer and the pots will grow accordingly. In practice, Hold'Em players will find that the focus in Omaha Hi tends more towards playing the cards than playing the other players. The player is dealt four hole cards. The original version of Pai Gow used special dominos and dice. It's said to be a rather complicated game, played slow enough to serve as a social event and is rarely seen in gaming houses outside of Asia. The modern, Westernized version is played with a deck of 53 cards -- regular deck plus a Joker -- and uses poker-like hands for ranking. It's still a complex game but the changes make it more approachable, as indicated by its success in casinos throughout the world. And it's still a rather slow game with showdowns often resulting in ties. This serves as a fine counterbalance to the faster playing casino fare, and it allows a player with a modest stake to last longer at the table than would be possible with other games. Pai Gow is often a multi-player game where the deal rotates around the table much like regular Poker. One of the traditional rules is that the dealer also acts as banker for that hand. In online play all of this is simplified to the player-vs-house model. Bets are placed and the player receives seven cards. From these seven cards the player forms two hands: a two-card hand called the "low" or "front" hand; a five-card hand called the "high" or "back" hand. The goal is to beat the dealer on both hands. The back hand is ranked as in Poker with the exception that A-2-3-4-5 is the second-highest straight beating K-Q-J-10-9. The front hand is singles or a pair, with A-A being the highest. There are a few additional rules. First, your front hand should not beat your back. If it does, this is called a "foul" and both hands lose. Second, the Joker can be used as a wild card to complete a Straight, a Flush, a Straight Flush or a Royal Flush. Otherwise it is treated as an Ace. Betting in most online games is very simple in that you make a single opening bet and that is the end of it. In some Pai Gow games there are separate bets for the front and back hands, but this is unusual in on-line play. If both hands lose to the dealer, you lose your bet. If both hands win, you win even money. If one hand wins and the other loses, it's a push. If your hands are the same as the dealer's, called "copies", the dealer wins. Obviously that’s an attraction of playing dealer/banker in multi-player games. In such games, you minimize your losses by betting low when you are a player and being dealer/banker whenever possible. If the player wins, the house takes a 5% commission: you get $4.75 of a $5 winning bet. There are a number of issues related to the multi-player games when it comes to the dealer/banker question. Keep in mind that none of this applies to typical single-player on-line play. Dealer/Banker: In multi-player Pai Gow games the bank rotates from person to person, where a player may pass the deal if they choose. If you want to deal you must have enough money on the table to broker all other bets made. If you are uncomfortable with the full risk of banking, another player may co-bank with you as dealer and the two of you will split the wins and losses. The house will bank if no player is willing to do it. If a player is banking, the dealer can be a player, wagering as the banker asks. If a player is the banker then the dealer will first compare their own hands to that of the banker and make the appropriate payments. Then the dealer will take the banker's cards and compare them to the other players, using the banker's money. Red Dog is a card game similar to Acey-Deucey and In-Between. The game is played on a blackjack-sized table with two betting spots -- "bet" and "raise" -- using a 52-card deck. Only three cards are played per hand. Card suit is not relevant in Red Dog. The popularity of Red Dog is largely due to its simplicity. As the pros say, if you can remember the number seven and know how to subtract, then you can play Red Dog as well as anyone in the world. As a player, you place an opening bet and the dealer will deal two cards. The object of the game is to bet on the likelihood that the rank of a third card is going to fall between the first two. If it does fall between, you win. If it doesn't, you lose. So far, it's too simple. This is where the "raise" bet comes in and it's based on the "spread". Spread is the number of card values that lie between the two initial cards. The value of any card from 2 to 10 counts at face value, a jack counts as 11, a queen as 12, a king as 13, and an ace counts as 14. A couple of examples are worthwhile. Let's say the dealer deals a 7 and a 10. What's the spread? Since 8 and 9 fall between the 7 and 10, the spread is 2. Ok, let's say the next hand plays a 4 and a 5. The spread? Since the cards are consecutive, no cards fall between 4 and 5, it's called a "tie", you keep your money and the hand is over. The interesting part of Red Dog is betting on the spread. This is an optional second bet where you go for a bonus payout. The house sets the odds based on a simple principle: the narrower the spread, the higher the potential payout ("bonus"). As indicated, you open with a bet and the dealer deals two cards. The cards are placed face up on the table and the dealer will place a marker to indicate (a) the spread and (b) the odds the house offers on an additional bet (the "raise"). If you bet no further, you will win your original bet at even money if you win the hand. If you do decide to raise, you're betting at house odds as printed on the Red Dog table. If you win, you get your original bet at even money and the raise bet at the odds indicated. If the first two cards are a tie -- consecutive cards -- you keep your bet. If the two cards are a pair, betting stops but you'll get paid at 11:1 if the third card makes it three of a kind. Otherwise you lose your bet. Finally, if the third card matches either of the first two, you lose your bet. Texas Hold'Em is the darling of pro Poker players, spectators, and the media. It's an aggressive, flashy, intense and unpredictable game that gets the dollars on the table and changing hands like no other contemporary form of Poker. All that and it looks deceptively simple to play. The old hard-nut players may prefer 7-Card Stud, but everyone else is in love with Hold'Em. It's no coincidence that Hold'Em is the game that players at the World Series of Poker play to determine who takes home $1,000,000 and the champion's custom 14-karat gold bracelet. Hold'Em is clearly a descendant of 7-Stud in that players form a five-card hand from seven available cards, but that's where the similarity ends. In fact, only two cards are actually held by the player as pocket cards. The other five are open, dealt to the middle of the table and shared by all players. Of course this means there are less cards in play, which is why Hold'Em typically seats nine or more players at the table. The dealer in Hold'Em is marked by a disk called the button. For each hand the button rotates to the left. Players are identified by their seat position. The dealer is seat one, the player to the dealer's left is seat two and so on, clockwise around the table to the player on the dealer's right which is typically seat nine. In practice, casino Hold'Em has a fixed (house) dealer and the button rotates around the table simply to mark the rotation of theoretical dealer. Betting position significantly affects a player's opportunities so the button's position in not simply symbolic. Hold'Em comes in many low-limit/high-limit forms. Beginner games are typically $1-$2 or $2-$5, but the high end can be as much as $300-$600, $500-$1000 or more. Regardless of the limits, Hold'Em is designed to be a money game. Instead of a small ante in 7-Stud, Hold'Em uses two forced bets, the blinds, to get Bets on the table right from the beginning of the game. The first player to the dealer's left -- seat two -- is the small blind and must kick in half the lower limit ($5 in a $10-$20 game). Seat three is the big blind and must kick in the full value of the lower limit ($10 in a $10-$20) game. The deal rotates clockwise around the table beginning with the player to the big blind's left. Each player is dealt their first pocket card in turn, then their second. Since the blinds opened with their forced bets, seat four, the player to the big blind's right, bets first. They Call by matching the big blind ($10, the lower limit) and may also Raise by kicking in the big limit, $20 in our $10-$20 example game. In this round Checking is not permitted so a Check is the same as Folding. The blinds in Hold'Em are live in that they can Call, Raise or Fold when the betting has returned to them. Once the first betting round has completed, the dealer lays out the first three community cards in the center of the table. This is called the flop. This betting round begins with the blinds, or the first remaining seat on the dealer's left. Checking is permitted now and for the rest of the hand. Bets are placed at the lower limit ($10 in our example). A fourth community card it dealt onto the table. Betting begins with the blinds, as before. Now, and for the rest of this game, Bets and Raises are at the high limit ($20). As such, the turn is the first expensive street. The fifth and final community card is dealt. This is also an expensive street: Bets and Raises are all at the high limit ($20). As in 7-Stud, the best 5 card hand wins. Players may form their final hands from any combination of the table cards and their own pocket cards, even ignoring the pocket cards and using only the table cards if they wish. One point on which Hold'Em departs from other poker games is the option for any player to see another player's pocket cards once they've been mucked. Provided the requesting player has Called or Raised the last Bet made, they simply ask the dealer and the mucked cards will be retrieved and shown. To the newcomer this move may seem incredibly invasive, especially if they come from a Draw poker background where such a move would be heresy. However, in the Hold'Em context, it's one of the few ways to gain insight into an opponent's play style. And how and when the pocket cards are played is a critical part of the game. A, K, Q, J, 10 all of the same suit. The Big Kahuna. The hand everyone strives for and the reason we play this game. Any five card sequence in the same suit. (Ex: 8, 9, 10, J, Q and A, 2, 3, 4, 5 of same suit). You can take this hand straight to the bank. All four cards of the same index (Ex: K, K, K, K). A great hand when you can get it. Three of a kind combined with a pair (Ex: A, A, A, 5, 5). Many a round has been won and lost on this hand. Mostly won. Any five cards of the same suit, but not in sequence. No need to turn red with embarrassment with this hand. Five cards in sequence, but not of the same suit. After all, you wouldn’t want to clash. Two separate pairs (Ex: 4, 4, K, K). Two cards of the same rank. (Q, Q) Sometimes called a San Francisco Pair. Highest card in your hand. Well at least you tried.